After years stuck in a tiny pen, he was just sent to the most beautiful sanctuary in the WORLD. A bear named Napa has never known a life without a cage. That's because the bear was born in a zoo and then given to a circus in Serbia, where he was forced to perform tricks for audiences. Serbia banned the use of wild animals in circuses in 2009. Since then, Napa has been living in a zoo in a hard concrete enclosure. It's hard to know for certain whether something inside Napa yearned for what he had never actually known, like the wild forest, smelling of fresh grass and soaked in sunlight, where he would have lived if he were allowed. 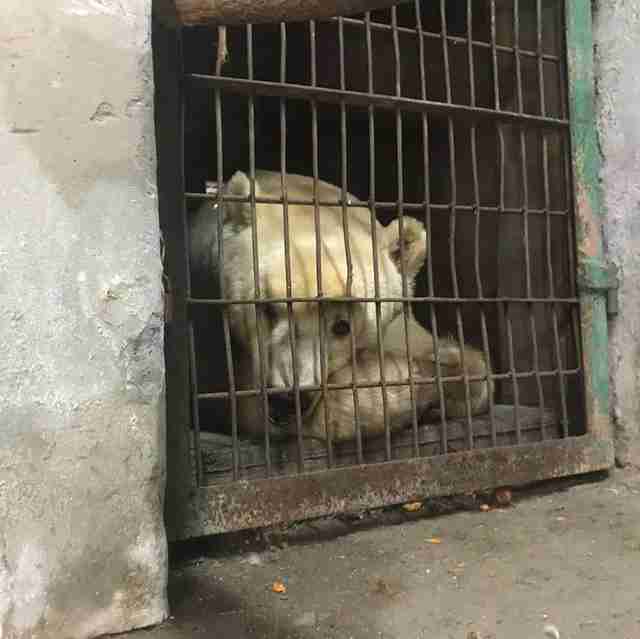 In a way, it didn't matter whether he knew what he was missing or not — because people from Four Paws International were determined to give him a life appropriate for a beautiful bear like him. 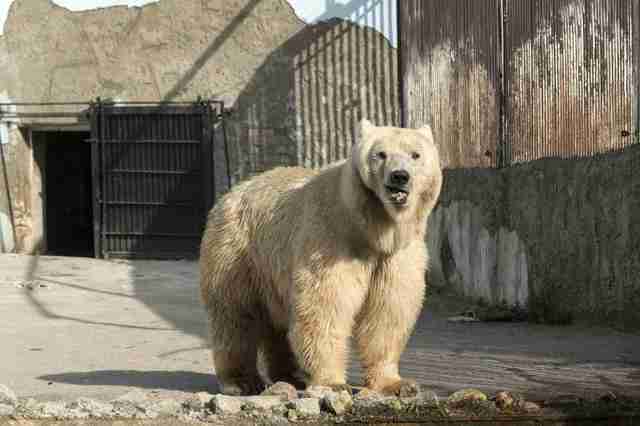 In early July, rescuers arrived at Napa's dismal enclosure in Serbia and tranquilized him for the journey of his life. Napa was accompanied by rescuers who had the sometimes complex logistical task of figuring out how to transport the 1,200-pound crate containing the rescued bear to his new residence on a hill. 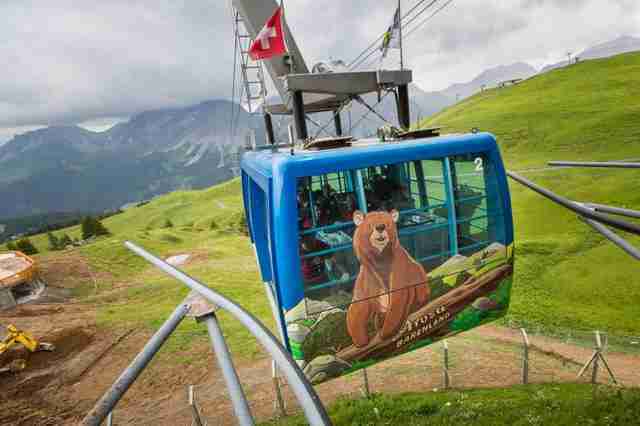 The journey spanned nearly 900 miles and involved 28 hours of travel, both by car and by suspended cable car — like a ski lift — over a lush valley in Switzerland. 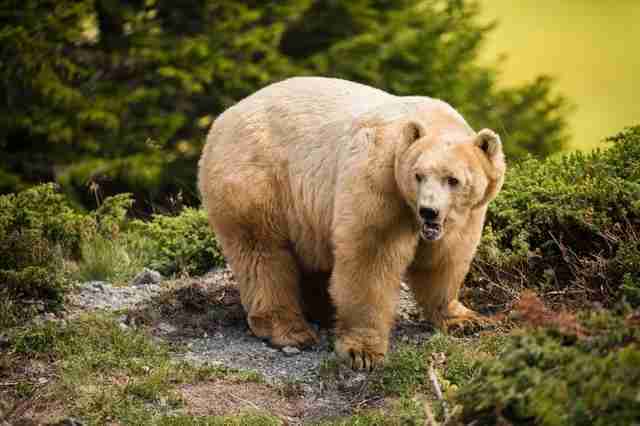 Finally, on July 4, Napa arrived at his new home, Arosa Bear Sanctuary, a brand-new sanctuary run in part by Four Paws. He was put into an enclosure where he could see his new environment without being overwhelmed by the change, since he'd never been in such a sprawling space in all his life. Napa was given treats to make him feel calm, safe and loved. He was also given a refreshing shower with a hose, which he seemed to thoroughly enjoy. When he looked around him, Napa almost appeared to have an incredulous look on his face as he scanned the picturesque horizon, where the Swiss Alps jutted up into the sky. Once Napa seemed to have acclimated to all the recent changes in his life, rescuers decided to let Napa see just how beautiful his new home was. Napa was allowed out of his enclosure earlier this week. "The door opens and Napa puts his paws on the grass," Four Paws wrote on Facebook on Saturday. 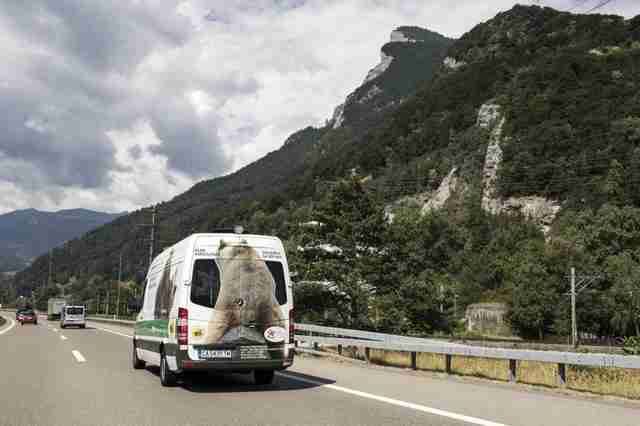 "Yesterday was a big day for the first resident of Arosa Bear Sanctuary. 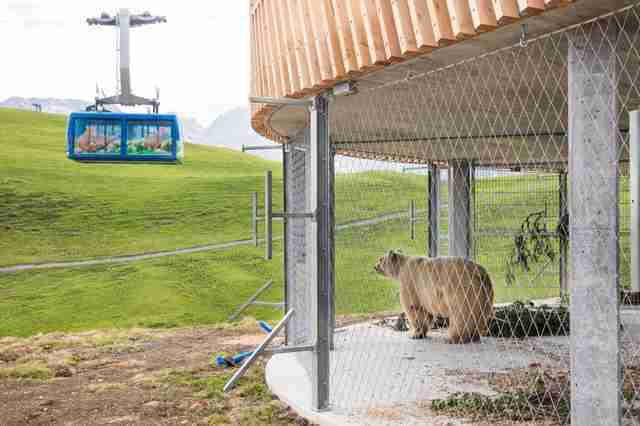 Napa was released into his beautiful outdoor enclosure with an amazing view over the Swiss mountains." Where before Napa had seemed exhausted and weighed down by his life, which had been lived in a series of cages, the bear's manner was light and energetic. "While we may not know all the details of Napa’s previous life, we do know it involved a small cage, lack of veterinary care, neglect and boredom," Claire LaFrance, director of communications for Four Paws, told The Dodo. 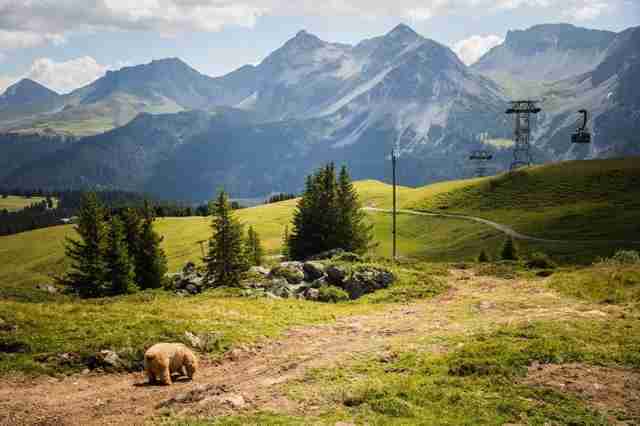 "Now Napa has an appropriate home for a captive-bred bear where he can run, climb and even swim all under breathtaking views of the Swiss Alps." And swim he would: Napa was recently spotted taking a very enthusiastic dip in his personal outdoor pool. Seeing the last circus bear from Serbia finally enjoying such a landscape, it's unmistakable: Napa is finally home. 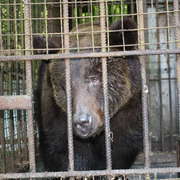 To help Four Paws save more bears from captivity and bring them to sanctuary, you can make a donation.